--- :-): Wow what a powerful God we have! Wow what a powerful God we have! 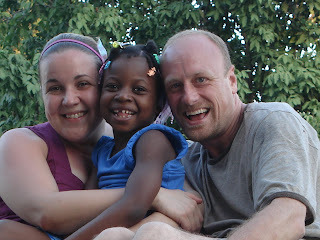 Well our last trip to Haiti was a tough one for me to prepare for. I wasn't sure why but for the first time I was not sure if I could go. It's been a interesting time for me and I have not shared much with anybody. I let some think they were hearing it all but really was keeping me to me and not allowing others to have to carry a burden. Many though came with ideas "how to help me". But really when it came down to it I just needed to see God use me when I knew that I could not be used. Have you ever been there? Well the trip to Haiti was different for sure but on ever hand God was showing me His love and mercy. He showed me His greatness by the things that He has already set up for BOSKO. He showed me his love through the peoples smiles and eyes. When I got home there was no time for rest because the next weekend was adventure weekend and that is with like 30 youth. Once again I hit a wall of not sure if I should be doing it. Once again God came through to show it's not me it's him. When I got home from adventure I visited a dear friend/family member of mine that has been very sick for awhile. I have been visited regular and have even had time with her talking when that was not suppose to happen. I ended up staying with her until about 2:30 am and had the great privilege to hold her hand and sing to her. I don't handle hospitals or blood to well but God had such a great peace in that room and I really believe I felt His love for her as I was able to serve her. What a honor it was and even though I don't have words I learned alot in the last few months being with her on her journey. Rose Ellen Stintchfield passed away Monday and I have been asked to do her funeral. It's my first but for some reason that anxiety of I can't have been replaced with the Love and grace that only God can give. God is allowing me to hear Him and walk with Him and not be moved by peoples ideas or emotions. Better than that not to be moved by my emotions or ideas! I believe He is teaching me to be a experienced pilot one that looks at and trusts the instruments that God has given Him instead of being moved by emotions and thoughts like a novice pilot is so often. I am not looking back and trying to figure out what I just went through but going forward in obedience of what His instruments tell me to do. Sometimes its hard because it means letting go of future plans you had, friends you had, or even your fears! But it's so much better because you are free.